Except Sean Parnell is well known to be Alaska’s worst Governor. Not just democrats think this. Ick Parnell? Why would they slam Sarah and then cozy up with her hand-picked successor? The letter implied support from 600 statewide members, that is not the case. 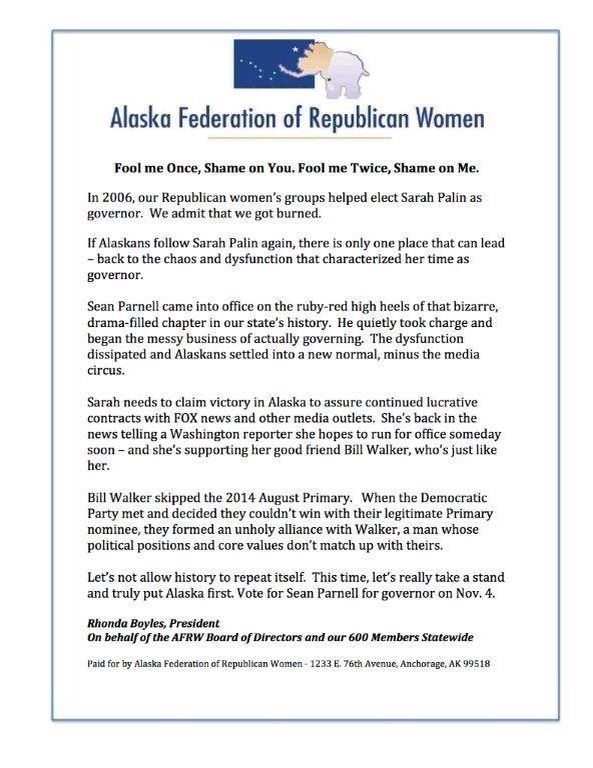 Poor decision in the wording and poor decision that the AFRW board had no concerns about the National Guard abuses suffered by women but would rather put out a hit piece just because Sarah is endorsing Walker, who is another Republican. Delay, stonewall, and play victim with the Sexual abuse scandal is enough in itself to kick Parnell to the curb. Choose respect wIth Walker.